Spelling has always been my thing. It just came naturally to me. I hadn’t really thought how I would teach my children to spell. My oldest is only five and just learning to read, so we haven’t been concentrating on spelling. 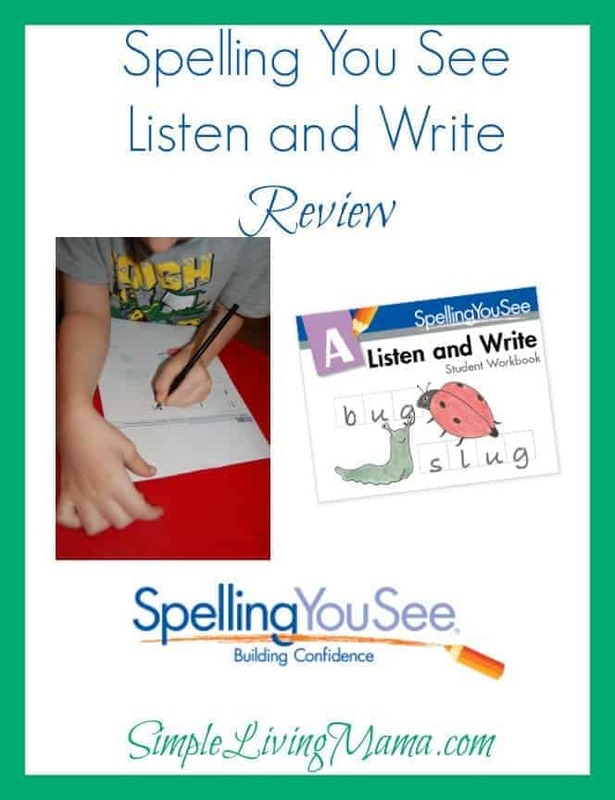 When I found out we would have the opportunity to review a brand new product from Spelling You See that is specifically designed for preliterate children, I was definitely willing to give it a chance! Spelling You See is brought to you by the same people who make Math-U-See. There are currently five levels available and we reviewed Listen and Write (Level A). We received a PDF copy for review purposes. Only physical copies are available for purchase. You can read more about these developmental stages of spelling and Spelling You See’s philosophy on their website. We are starting right at the beginning with Stage I. 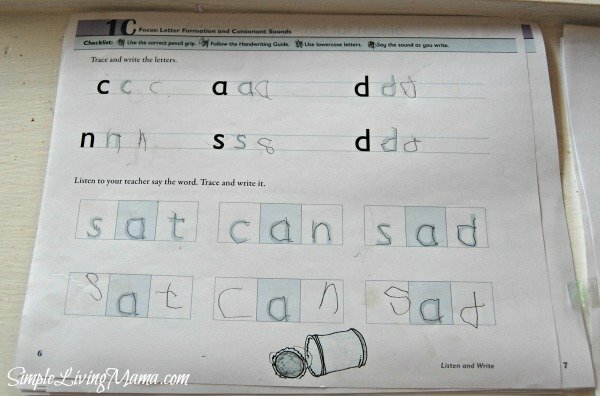 Listen and Write is designed to move children from the preliterate stage to the phonetic stage. While children are just beginning to explore the printed page, you can help them begin to learn how spelling works and how to form letters. There are no grade levels with Spelling You See. 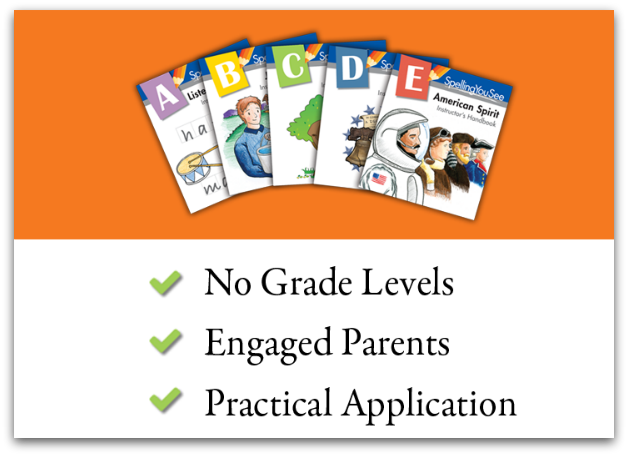 Each level is designed to advance with your child. 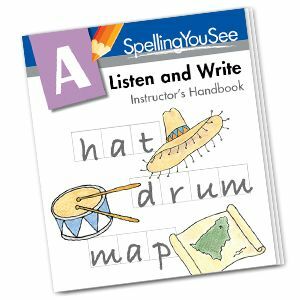 Listen and Write is designed for children who are just beginning to learn letter-to-sound correspondence and how to form letters. For simplicity’s sake, I would recommend using this product with children who are 4-7 years old. There are 36 lessons divided into five sections, A-E. Each lesson includes one worksheet per day that is designed to be completed in 10 minutes. You will receive a student workbook and an instructor’s handbook. The handbook tells you everything you need to know about the program and gives you lesson-by-lesson instructions. It also includes the dictation lists you will use as your child advances through the level. The workbook includes a handwriting guide to help your child correctly form letters and a sticker pack for little rewards. In the first three lessons we worked on correctly forming letters and learning consonant sounds. Only lowercase letters are used unless you are working with a proper name. Bug would first trace a letter while saying the sound, then he would write the letter while saying the sound. Then, on the same sheet, he would trace a three letter word while saying the sounds, then write the word while saying each sound. 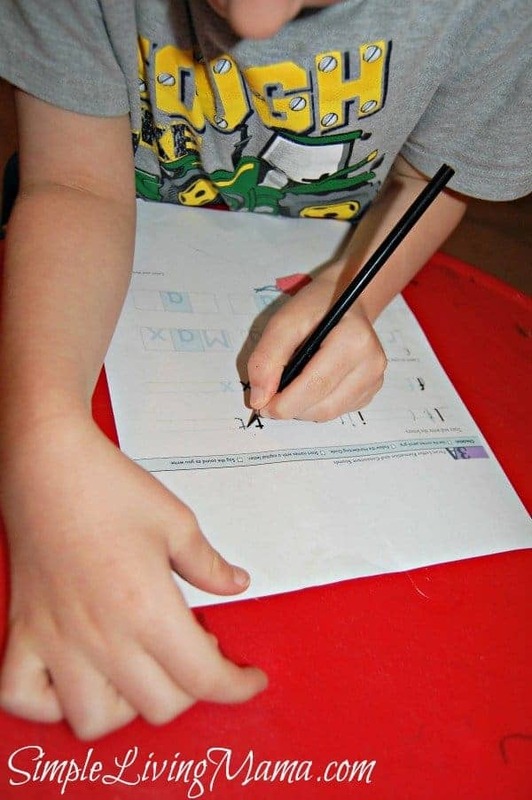 Saying each sound while writing the letter is a critical step as it makes a neurological connection between the letter and its sound. The next lessons include dictation. I say a word clearly and slowly, and then Bug writes the word in the letter boxes saying each letter sound as he writes it. I love everything about this program. First of all, my son actually asks to do the worksheet. That’s pretty cool. He enjoys doing them. The lessons are short and sweet. I love the approach. I love that we are doing dictation. I can see the sounds sticking in his little brain as he learns to spell words. 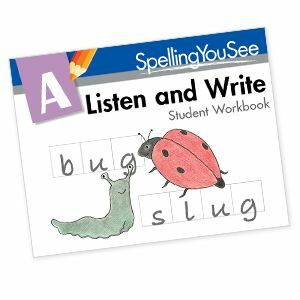 We are planning to stick with Listen and Write until we are finished, and I have a feeling I will stick with Spelling You See for our spelling curriculum. I honestly believe this works. Every morning we sit down and do our worksheet. Bug is a leftie, so I do have to work with him quite a bit on correct letter formation, but it is not frustrating for him. He enjoys writing the letters and words, and we are done fairly fast! The directions are completely laid out for me. Simple and easy! We absolutely recommend Listen and Write for beginner spellers! The Listen and Write student pack can be purchased for $20.00 and the instructor’s handbook can be purchased for $14.00. Find Spelling You See on Facebook and Twitter.